Peppadew is a trademark name. The peppadew pepper is a recent introduction to the culinary word, discovered on an errant bush growing in a South African garden near the Eastern Cape. Since its début at the Fancy Food Show in 2002, its unique, delicious flavour, a mixture of peppery and sweet, has become a popular choice throughout the western world. Looking like a cross between a miniature red pepper and a cherry tomato, some people believe that the peppadew pepper is nothing special at all, and is only a normal miniature red pepper that has been processed using a special, secret recipe. 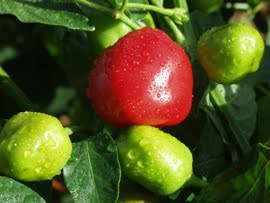 However the peppadew company states that is new variety is a sweet piquanté pepper. 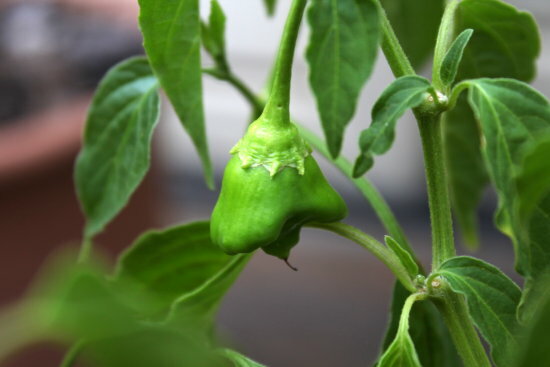 Although clearly controversial there is also a mystery that surrounds the peppadew plant due to the complete lack of availability of its plants or seeds on the open market. It turns out that the distribution of peppadew plant material is strictly controlled and the growers of the peppadew ‘fruit’ are made to sign a contract which, if they are found to be distributing seeds outside the company, could face prosecution from the licence holding company. So jealously controlled are the movements of this plant that the production fields are actually guarded! This intense control and security over what is at best a naturally occurring hybrid has resulted in a ‘growing’ underground movement formed by a small group of incensed yet passionate gardeners. Believing that the entire peppadew operation is extremely ‘thug-like’ and that any naturally occurring hybrid should belong to the world, they will go to any lengths to secure, grow and distribute peppadew seeds around the globe. Should you manage to obtain seeds from the sweet piquanté pepper (legally of course) sow indoors around January for if you want them to establish quickly for outdoor planting or sow any time up to the end of March for greenhouse growing. Sow your sweet piquanté pepper seeds 1/2 inch deep into either 3 inch pots or a modular seed tray containing John Innes ‘Seed and Cutting’ compost. Water in and then once the excess has drained away place inside a heated propagator at approximately 20-30 degrees Celsius. Place on a warm bright windowsill but one that does not receive direct sunlight as this can cause the seedlings to scorch and the compost to dry out. If you do not have a heated propagator then seal the pots or tray inside a clear polythene bag. Once germinated, this will be normally between 7 and 24 days, remove the pots or tray from the propagator or bag. Once the modular seedlings have established their roots they can be potted on into 3 inch pots. 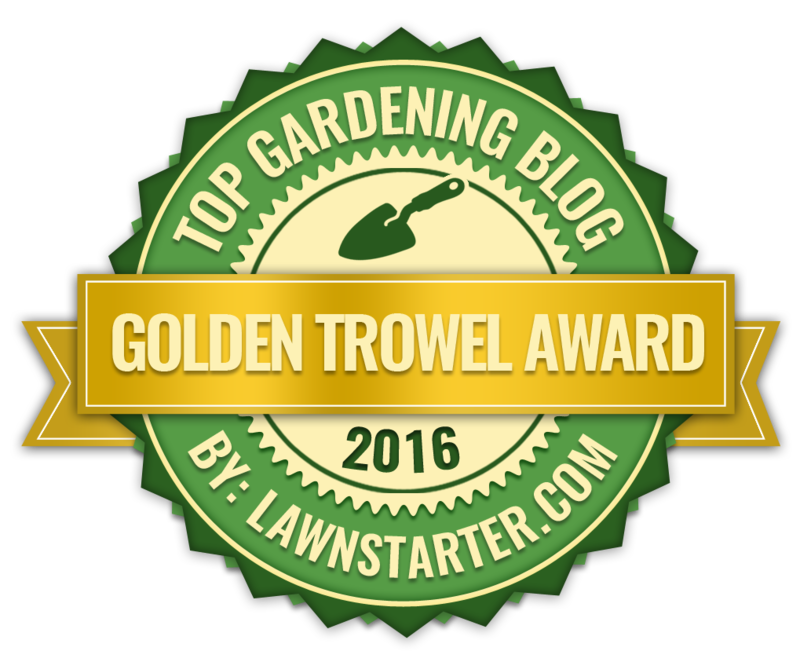 Avoid damaging the fragile root system at all times. Grow them on for another couple of weeks and once the threat of frosts is over they will be ready for either the greenhouse or for planting directly outside into open ground. Make sure you choose a location that is in full sun and consider mixing plenty of organic compost before planting to help keep the soil fertile and moist. Of course remember that peppadew peppers are a brand name for processed sweet piquanté pepper. 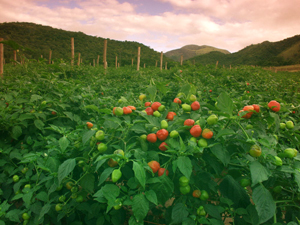 Applications have been made by the Peppadew Company to The International Union for the Protection of New Varieties of Plants, otherwise known as the UPOV. With this in mind there can be no breeding of the peppadew pepper without the express permission of the owners of these rights - AVI (South African Company).